No trip to Barcelona is complete without a tour of La Sagrada Familia! When filming an episode of No Reservations in Spain, Anthony Bourdain once emphatically declared, “this is the best place in the Western world to eat!” The entire Iberian Peninsula is surrounded by water, after all, providing its inhabitants with fresh seafood and rich agricultural bounty. Just last year, Spain was the second most visited country in the world, and the tourists weren’t there just for the food. If you’re lucky enough to visit a Spanish city this summer, read on to discover the sights you can’t afford to miss! Journey through the tightly packed streets of Madrid to Plaza Mayor, the city’s grand central square. Tourists and locals alike spend time in the square, appreciating the wide open space amongst the bustling city. It’s best to enjoy the Plaza in the afternoon, after a long day of sightseeing. Cool off with an ice-cold beer, and savor the city’s signature specialty: the calamari sandwich! No trip to Barcelona is complete without a tour of The Basílica i Temple Expiatori de la Sagrada Família. 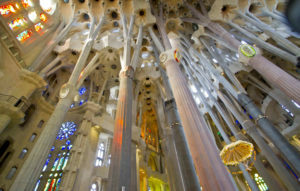 Antoni Gaudí’s unfinished Catholic church is a UNESCO World Heritage Site and attracts over three million visitors a year. The foundation stone was originally laid in 1882, and the church is projected to be completed in 2026 to mark the 100th anniversary of Gaudí’s death. Sign up for a guided tour, and spend an hour or two marveling at the sheer splendor of the interior architecture. Pictures and films do not do La Sagrada Familia justice. It’s a sight you’ll have to see for yourself. Built between 1482 and 1548, La Lonja de la Seda (the House of Silk Traders) is a UNESCO World Heritage Site. The building is an example of late Valencian Gothic architecture, and its history is well known in Spain and throughout the world. Visitors can easily spend an entire day exploring the three parts of La Lonja, learning about the city’s silk industry and admiring the intricate interior design. Fans of Game of Thrones go giddy over The Alcázar, a royal palace and UNESCO World Heritage Site in Seville. It isn’t just a stunning fortress, but a filming location for the HBO show’s second and fifth seasons. The Ambassadors’ Hall, Mercury’s Pool, and the Baths of Maria Padilla can all be found on the show. Live out your GOT fantasies in real life and take a guided tour of The Alcázar! Experience an exhilarating adventure on the Cosmopolitan, Explorer, and Continental tours. It’s never too late to get a taste of a multitude of exciting cultures! Explore Spain on the Discover Spain tour! This entry was posted on Wednesday, July 18th, 2018	at 10:00 am	. You can follow any responses to this entry through the RSS 2.0	feed. You can leave a response, or trackback from your own site.